The founder and the president of Brothers Electric, Joe has more than 25 years of experience in the electrical design and construction industry. He is a graduate of the George Washington University and holds a B.S. in Electrical Engineering and Computer Science. 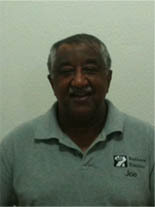 Joe is also licensed as a Master Electrician in the District of Columbia, Maryland, Virginia and West Virginia. Samir has a Master Electrical License in the District of Columbia. He is a graduate of the George Washington University and holds a M.S. in Electrical Engineering. 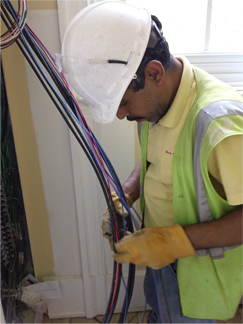 Samir has more than thirty years of experience in electrical construction. He has been working on new construction and renovation projects in residential, commercial and government facilities. Since Mr. Qasem's graduation from electrical technical school, he has been working in the field of electrical constructions. He has more than 25 years of experience in electrical installation, maintenance, repairs and troubleshooting. Mr. Qasem's construction experience is in both low and medium voltage systems including airfield lighting. Shaddy has over ten years of experience in the construction industry. He is a graduate of Howard University and holds a B.S. in Electrical Engineering. He directs a wide range of tasks for projects including government, commercial and residential. Mr. Abdelaal is a native Washingtonian who is passionate about being involved in ventures that create a healthy, highly efficient and sustainable environment for the community. Brothers General Construction, Inc., T/A Brothers Electric was founded in the District of Columbia in 2008 to provide exceptional electrical services in the metropolitan area. Brothers Electric is certified as a local small disadvantaged Business Enterprise (LSDBE) with the District of Columbia Department of Small & Local Business Development. Brothers Electric has grown quickly by maintaining a high standard of performance and by absolutely satisfying customers. Brothers Electric performs all kinds of electrical services for renovation and new construction for residential, commercial and government facilities, including your indoor and outdoor needs for lighting and power requirements, fire alarm system, emergency generators and UPS system. 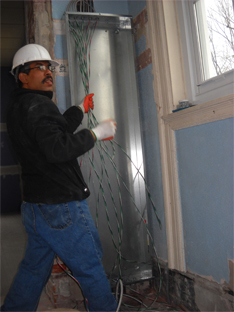 Brothers Electric stresses quality workmanship, professionalism, stability and experience.